Our first crop of veggies has come to fruition! 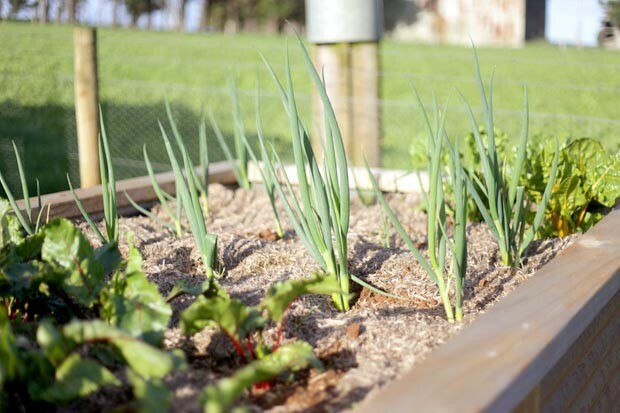 After Matt’s epic mission to build our three large raised beds (away from those pesky rabbits, and hopefully possums) I planted them out with cabbage, spring onions, brown onions, rocket, beetroot, radish, silverbeet, spinach, broccoli and leeks. Our store-bought rocket seedlings went to seed very quickly, always the case, but thankfully Matt’s mum gave me a little seedling of her amazing rocket – slow to seed, light and peppery, thin and long rather than broad and tasteless. I pulled out our bolted rocket and fed it to the grateful chooks, and used our radishes and rocket in this salad. 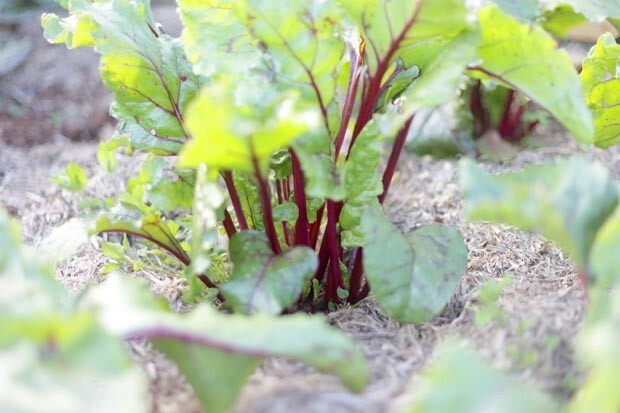 Next up are the beetroots which are almost ready to pull up. I’m never sure how long to leave them brew under there, I want them big enough but not bitter or tough. 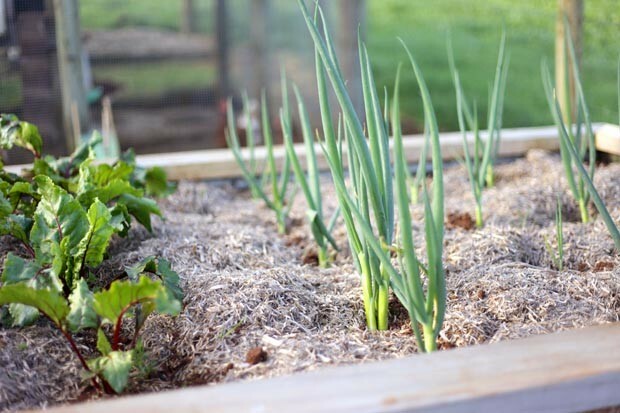 The spring onions have just finished now too, lots of them being thrown in salads and cream cheese dips, I also use them just the same as a brown onion if I have heaps in the garden. 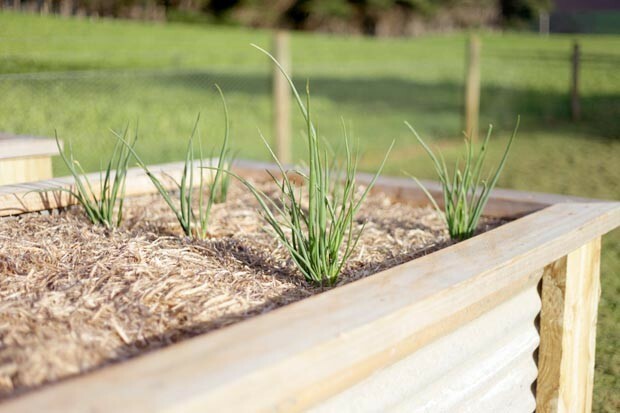 I’ve planted loads of leeks, Matt loves them so it will be leek o’clock in our house soon! The silverbeet is always just prolific. I need to remember to just go cut off a big armful for a quick and easy lunch – mushrooms, garlic, wilted silverbeet, loads of butter, salt, pepper, yum. The raised beds have been awesome, Matt built them quite high (‘Matt height’) which I was a bit worried about but I actually find them great that little bit higher. As they’re on a slope too the one closest to the chook pen is actually a shorter height, with the one further away at the highest point. The space in between perfectly fits the pram too – so considerate! With our first plantings in the veggie patch I was a bit slap dash, just whacked things anywhere. I want to get a bit more organised with my plantings – all the nightshades in one bed, that sort of thing, get a good rotation going. These three big beds are more than enough space for us at the moment, I could have definitely planted things like the onions and leeks closer together though. 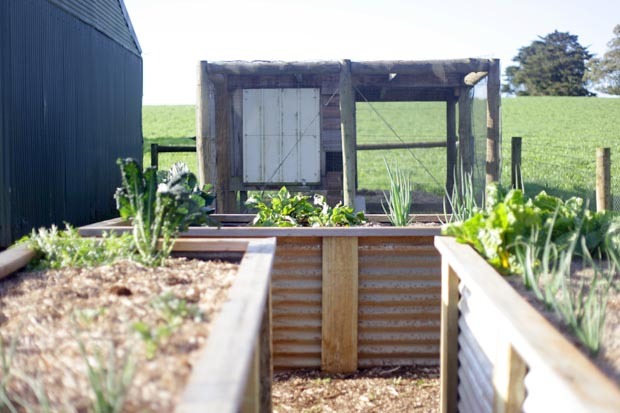 We did make a bit of a rough bed behind the chook pen, not raised, just for rambling things like pumpkins and zucchinis, but unfortunately the soil we used to fill it has far too much clay in it and we’ve got some considerable drainage issues! I see some gypsum in our future. 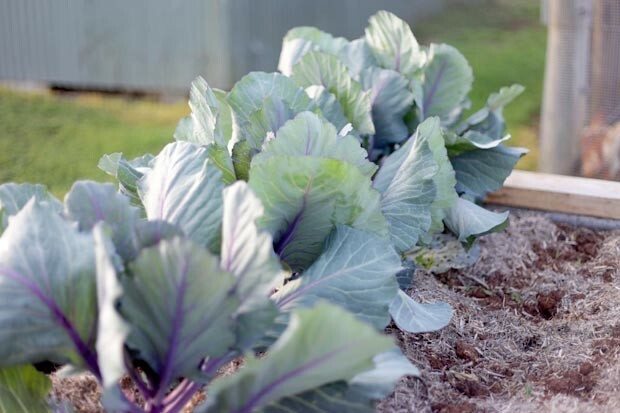 The cabbages are getting humungus – even if they don’t bear me any cabbages, I just love their big elephant ear leaves. 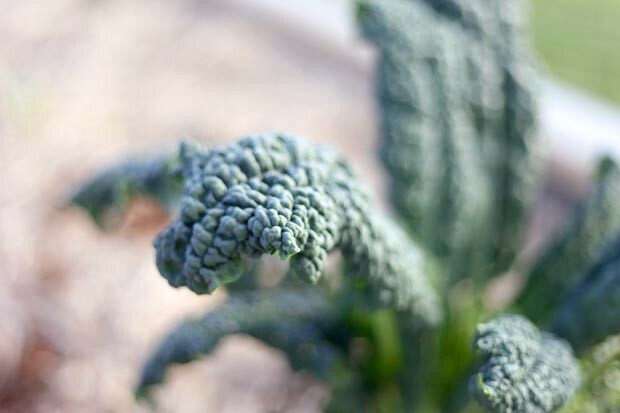 And the kale…well I’m sorry kale but I’m a bit over all the kale. No more kale, people. With the change of the seasons thoughts are turning to tomatoes and strawberries, I’ve planted both but no sign of germination for the tomato seeds yet which is a bit worrisome. I’ve also got some bean seeds to sow, with thoughts for a bean teepee for Eleanor…because: bean teepee! 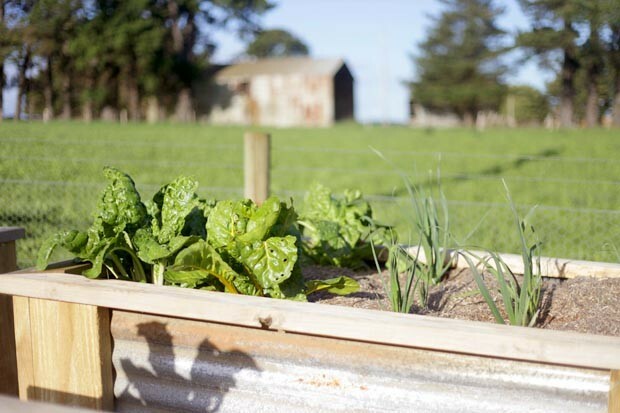 What’s growing in your patch at the moment? Sown your tomato seeds yet? Ever done a bean teepee? Our tomato seeds haven’t germinated yet & it’s beginning to stress me out!! We are starting from scratch with our veggie garden after moving & it’s driving me nuts not having fresh produce in the garden! I hate having to buy it! Our garlic & shallots are doing well at least! I’ve given up hope on the tomatoes and bought some seedlings…I don’t know what happened?!!! Oh dear. 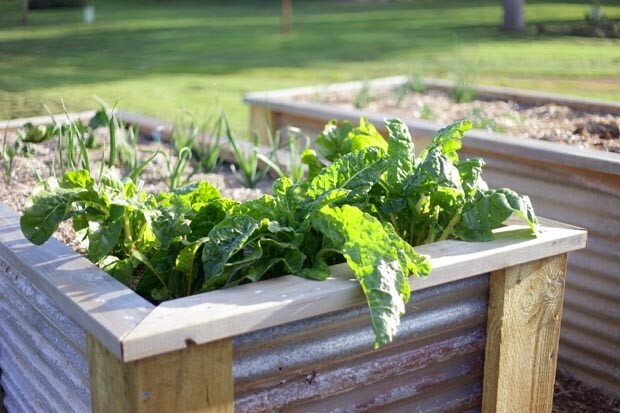 Those raised garden beds look fantastic. Handy hubby’s are the best! My brother in law and my fella did a kind of ‘handy swap’ a few months ago. Bro in law loves working with wood so he made me a large reclaimed pallet planter box. In exchange my hubby made them a spinnable compost bin out of an old oil drum. Even though it’s getting late into spring, I really need to chuck a few more vegies in! I love that! Matt has just recently bought a welder, working with steel isn’t his preference but I’m hoping for a few more steel projects in the future – a spinnable compost bin out of a drum is brilliant! I’m going to put my request in. Every time I see your garden I get a bit of garden envy. Living in FNQ my ‘spring’ veges have been in and growing for a while. Our tomatoes are plodding along and beans have just finished. I think I’ll plant some more beans today and see if I can squeeze in another crop. I have had to get creative with paperbags to stop whatever it is eating my tomatoes. Strawberries are ripening at the moment and my climbing spinach is doing well. Apparently they do well with heat. It has taken us 2 and a 1/2 years to get the garden this productive. Good luck with the beans, tomatoes and strawberries. Climbing spinach? Interesting. Our garden is still very much in it’s infancy, can’t wait to see it in 2 and 1/2 years like yours!